Spores of SCP-770 immersed in 12% tritiated water during experimentation. Special Containment Procedures: SCP-770 is to be stored in a 500 ml flask made of isotopically pure iron-56. The flask is to be evacuated of atmosphere, and stored in a de-pressurised steel safe, lined with isotopically pure iron-56 foil and 7.5 cm of lead. Currently, SCP-770 is stored at ███████ ███ ██. SCP-770 is to be given nutrients in the form of 20 milligrams of technetium-95m gas, produced by the research reactor at ████ ██. These are to be administered twice a year. SCP-770 may be removed for research and experimentation, providing a detailed research plan is approved by level 4 staff. All research staff must be qualified in dealing with radiological safety hazards. Research is to be carried out in an environmentally isolated laboratory, and research staff must use glove boxes or conventional bio-hazard suits. After SCP-770 has been returned to storage, the atmosphere of the laboratory must be purged, and any materials or instruments that have come into contact with SCP-770 are to be destroyed in a high temperature plasma arc furnace. Addendum 770-1: Following Incident I-770-1, SCP-770 is not to be exposed to fissile, or fertile super-heavy elements, including any isotopes of uranium, plutonium, thorium, or americium. Permission to perform experiments using these elements will be immediately denied. Agent ████████ has been posthumously commended for his quick thinking in preventing a [DATA EXPUNGED]. Description: SCP-770 is a strain of mould that is similar in appearance to the common Physarum polycephalum slime mould. It is largely colourless and translucent in appearance, and will adhere to almost any surface. What sets SCP-770 apart is that it respires without oxidisation by means of a poorly understood nuclear reaction. 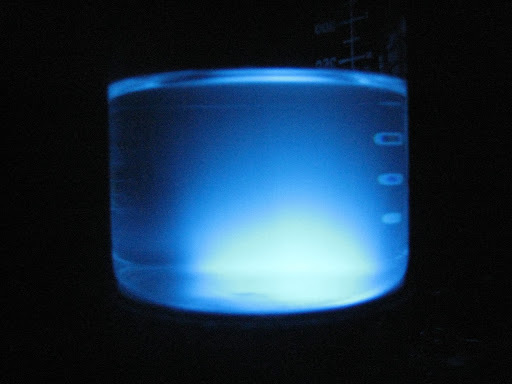 When present on a surface, SCP-770 will absorb any radioactive isotopes, or any isotopes larger in atomic mass than iron-56, with preference given to heavier isotopes. These isotopes will then undergo a nuclear reaction in which they are reduced to more stable isotopes, and energy is released. The decay products of this reaction (normally lighter elements such as carbon, oxygen, or nitrogen), along with the energy produced, are used by SCP-770 as a source of sustenance so it may grow and reproduce (which it does by the periodic release of airborne spores). There is a strong possibility that the elements produced by SCP-770 will also be radioactive isotopes. During ingestion and reaction of isotopes, SCP-770 will emit significant quantities of ionising radiation, including alpha, beta, gamma, neutrons, and hard x-rays. The radiation output is so substantive that an adult human would receive an LD50 level dose of radiation after approximately █ minutes exposure to 500 milligrams of active SCP-770. The mould will also release copious amounts of heat, and can achieve a surface temperature in excess of 1200 degrees centigrade. While doing this, it will appear to glow white hot. How SCP-770 is able to withstand this level of radiation and temperature without disintegration is unknown. Currently, the most feasible way to sterilise an area of SCP-770 is by means of specialised plasma arc furnaces that are designed to reach temperatures of 3000 degrees centigrade (although Incident I-770-1 demonstrated that thermite, when used in a confined area, can also be effective). Due to the relative abundance of viable isotopes, the vast energy produced by nuclear reactions, and the propensity of neutron irradiation to create more unstable isotopes, SCP-770 has an extreme capacity for growth. With adequate food supply, SCP-770 will produce spores approximately every █ hours, and is capable of doubling in mass every ██ hours. As no known herbivores or herbicidal diseases could survive exposure to the radiation produced by SCP-770, there is no limiting factor to the mould achieving a geometric growth rate. In the event of a containment breach, or worse, a [DATA EXPUNGED] event, projections indicate that the mould would spread quickly, and the Earth’s biosphere would be rendered un-inhabitable after approximately █ months. Sterilisation of affected areas via nuclear weapons may be a viable option; however, should SCP-770 survive the initial blast, then fallout would provide a tremendously rich growth medium. Historical note: SCP-770 was recovered from a large series of deep caves beneath █████ in the former Soviet Union, in 1957. A lack of viable isotopes in a geological stratum that should have been uranium bearing implies that SCP-770 has been active in this cave system for a prolonged period of time, possibly up to █████ years. Shock damage, partial vitrification and a build up of radioactive gasses in one of the caverns indicate that SCP-770 may have undergone a [DATA EXPUNGED] event at some point in the last ███ years. A publicly owned mining industry broke into the cave system in 1957, resulting in the [DATA REDACTED]. Fortunately, no spores of SCP-770 left the cave system, allowing the caverns to be purged when the incident was discovered by the Foundation. Estimates made after ascertaining SCP-770’s growth rates project a breach of the cave system would have been possible after █ years, had the mould not been brought to the Foundation’s attention.